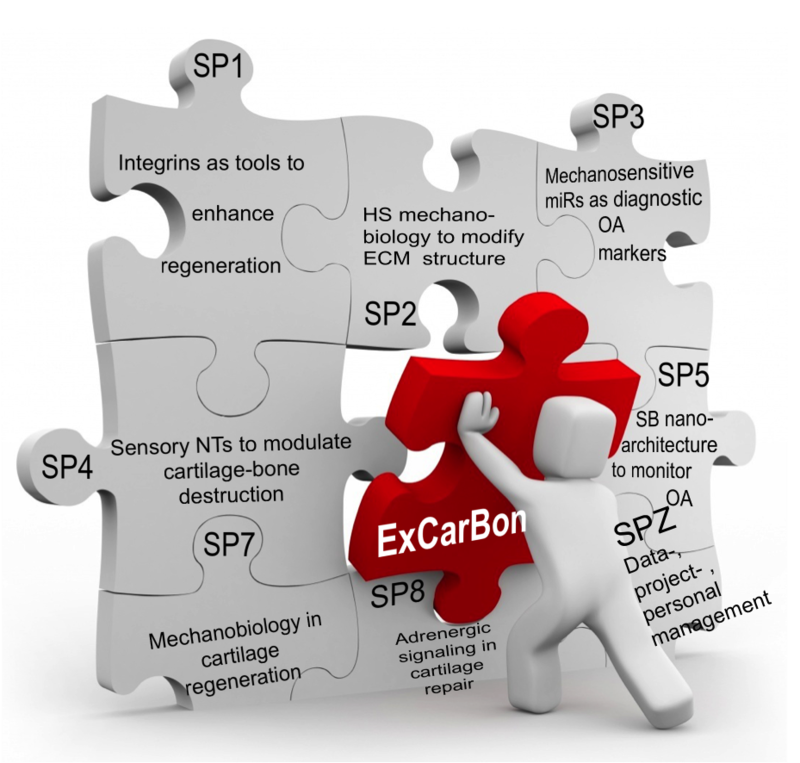 ExCarBon - Bone Degeneration and Regeneration - excarbons Webseite! The primary goal of this consortium is to establish common structural, mechanical and molecular determinants of cartilage and subchondral bone degeneration and regeneration. The overall research concept connects cartilage/bone pathophysiology (OA) to regenerative osteo-chondrogenesis. This is expected to result in the development of novel strategies to halt OA progression and in improved therapies for the treatment of osteochondral lesions. Although multiple etiological factors have been implicated in the onset and progression of OA, physiological and aberrant mechanical stress remains the major acquired determinant of joint failure adversely affecting both the articular cartilage and the subchondral bone. Thus, elucidation of mechanotransduction pathways by which mechanical disturbance leads to pathologically impaired cartilaginous and bony tissues has a particular importance in our understanding of the disease. Furthermore, cell-based regenerative strategies should include appropriate mechanical conditioning and tissue-engineered (TE) construct design for the successful restoration of joint function. "Elucidation of mechanotransduction pathways by which mechanical disturbance leads to pathologically impaired cartilaginous and bony tissues has a particular importance in our understanding of the disease." This approach requires synergistic and multidisciplinary pre-clinical research, the application of a diverse methodological repertoire from the fields of medicine, life and material sciences and the use of various in vitro and in vivo models. Combining expertise from many different areas such as orthopaedic surgery, molecular and cell biology, chemistry, biochemistry, physics and tissue engineering in an interdisciplinary manner is absolutely essential to the success of the proposed consortium. The composition of the consortium reflects this multidisciplinary nature as all participating groups are highly specialized in the musculoskeletal system with a focus on cartilage and bone research combined with a profound knowledge of important molecules fundamental for cartilage and bone physiology and pathophysiology. All PIs have an excellent publication record in musculoskeletal research and are well known in the national and international scientific community. Another advantage is the close collaboration of basic scientists and surgeons, which effectively combines experimental and clinical expertise imperative for the rapid translation of results into clinical routine. "Combining expertise from many different areas such as orthopaedic surgery, molecular and cell biology, chemistry, biochemistry, physics and tissue engineering in an interdisciplinary manner is absolutely essential to the success of the proposed consortium"